Move it, Movie it ….or something like that. GO! began a new kids game show this morning, but can’t seem to settle on the name for it. In this press release it was sometimes titled as Move It! and at other times Movie It!, as you can read in the unedited text below. Think the one without the extra “i” is correct….. 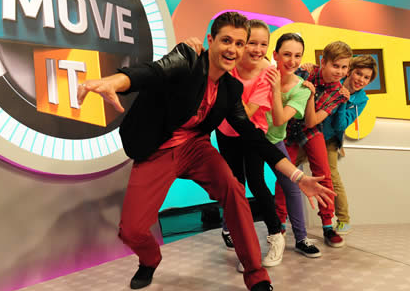 The energetic new kids’ game show Movie It! moves into mornings at 7.30am on GO! from next Monday, February 17. Each weekday on Move It! two teams of two kids race the clock to put different categories of subjects displayed on a chain of video screens in the correct order. The subjects could be the heaviest animals, the largest countries or fastest cars. After four rounds the highest scoring team goes on to play The Final Move It and vie for the ultimate goal of winning great prizes. Hosted by the always animated Nick Vindin, Move It! is a hectic game full of variety that comes down to how quickly the young contestants can think and react against a ticking clock. Movie It! is produced by Ambience Entertainment.